Emojis are the latest versions of emoticons that are being used more and more in cell phone communications and social media all over the world. For example, more than ten billion emojis were used only on Twitter in the past two years. Emoji meaning is that they are Unicode graphic symbols, used as shorthand to express emotions, perceptions and ideas. 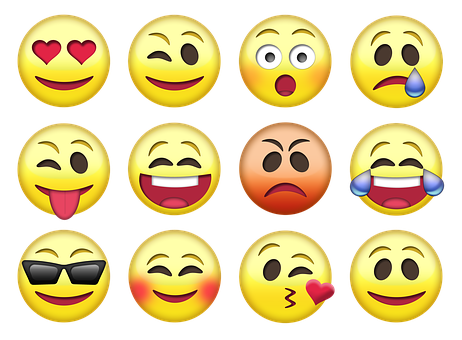 There are thousands of emojis in contrast to the small number of well-known emoticons that carry clear expressive contents. Emojis make the user more popular and distinct on social media. Research points out that positive emoticons can be a social media status maker. 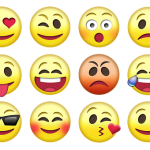 People react to the emoticons as if they are the human faces and express their moods by using the same while chatting or updating their status on social media. We as human beings swiftly understand and grab the important message mirrored in the face of emoticons. One can use the same organically in a business setting. Emoji is gradually being used to stimulate communication in organic and fully high range and professional setting. Workplace emoticons when used to convey a message, most precisely a negative feedback, helps the person who receives the feedback feel good about it and then he works on it. They help you appear more mobile friendly and up to date. They develop happier, more connected and equally understanding bond. There are a lot of emojis that are being used frequently on the Internet because of their seeming popularity. The most common emojis regularly used on social media are the face with tears of joy, black heart suit, loudly crying face, smiling face with smiling eyes, heavy black heart, frowned face, smiling face with heart-shaped eyes, black universal recycle symbol, two hearts, face throwing a kiss and so on. According to the latest studies, these are the top emotions expressed through the help of emojis as of now across the social media. You can see the nature of emojis and how widespread they are. Emojis are one of the fastest growing sets of emotions highly used in mobile chatting and on social media in the form of comical characters. Emojis have finally become mainstream. However, their usage is limited to only IM chats and Facebook status updates. But still, for some reason, emojis are not considered serious enough to be used in work related emails, blog posts, or printed media. However, this status may change soon given the increasing popularity emojis.